The moment drew gasps opening night at the Kennedy Center in Washington, which had been in the grips of a similar question in recent weeks — more gasps, even, than when a prisoner was stripped naked in another segment of the play. 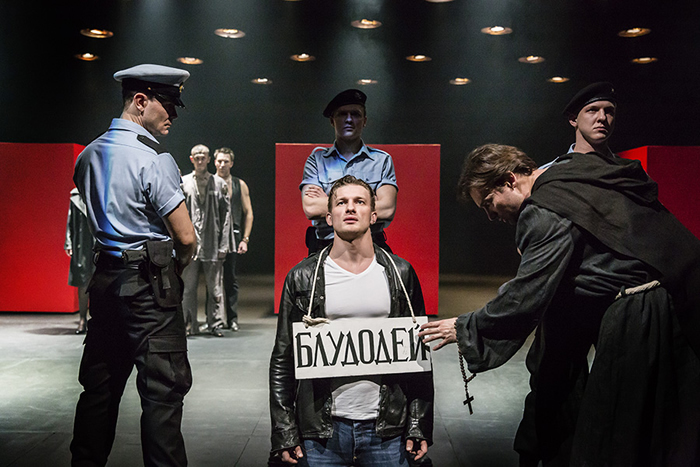 William Shakespeare’s “Measure for Measure” was written more than 400 years ago; the striking international co-production from the London’s Cheek by Jowl and Moscow’s Pushkin Theatre was devised some five years ago. But even when this year’s Kennedy Center World Stages season was organized, nobody knew exactly how timely “Measure for Measure” would be when it exploded on stage in D.C. in October 2018. That it was entirely Russian (with supertitles) seemed to add to both the other-worldliness of it all and the immediacy. The story of corruption and lust in Vienna under an interim leader gets a sharp, modern-dress version under acclaimed director Declan Donnellan. In front of a series of red boxes on an otherwise bare stage, the cast of a dozen or so at first flits and marches across the stage in tight formation, introducing the company who will present this old story. Claudio’s sister Isabella (Anna Vardevanian), a nun to be, goes to the temporary leader to beg for his life, something he’ll only consider if he can take her virginity. This dark turn would go unnoticed in the halls of power except that the Duke has been hanging out disguised as a friar, to keep an eye on this temporary leader. He is the one who devises some tricks to upend his plan and presides over an ending whose ultimate resolution, despite some charming waltzing, is still a bit unsettling — for one thing, he sends away Lucio (a very good Alexander Feklistov) to be beaten for badmouthing him, but that’s not the worst thing. Even so, the problem then is clearly our problem now, and rarely has it been presented so dynamically and deftly, trimmed down so much that it lasts under two hours, uninterrupted, and moves at such a breathless pace nobody would stand for an intermission anyway. “Measure for Measure” continues through Oct. 13 at the Kennedy Center, Washington, D.C.